The deliberate reintroduction of smallpox into the human population would be a horrible tragedy. Throughout human history, smallpox has been responsible for the death of millions of people and the disfigurement of many more. Smallpox is a significant threat to civilian populations due to its mortality rate of 30% or more among unvaccinated persons and the fact that there is no specific treatment other than supportive care. Although smallpox has long been regarded as the most devastating of all infectious diseases known to man, its potential for devastation is far greater now than at any time in history. Smallpox vaccination stopped in the U.S. more than 25 years ago. In a now highly susceptible, mobile population, smallpox would be a true international emergency, as it would be able to spread quickly and widely throughout the world. British soldiers in North America first used smallpox as a bioweapon during the French and Indian Wars. Soldiers gave blankets to American Indians that had been used by smallpox patients with the intent of infecting them with smallpox. As a result, smallpox epidemics wiped out more than 50% of the affected tribes. With the demonstration in 1796 by Edward Jenner that an infection caused by cowpox provided protection against smallpox, and the rapid worldwide adoption of vaccination, the potential for a worldwide epidemic of smallpox was greatly reduced. The use of smallpox against groups of Indians in North America caused a devastating loss of life. The last known person in the world to have smallpox of any kind. Here 23-year-old Ali Maow Maalin of Merka, Somalia exhibits the pox of Variola minor. Smallpox was responsible for millions of deaths in the 20th century alone. In 1967, the WHO began a global campaign to eradicate smallpox throughout the word. Through an intensive worldwide strategy of containment of smallpox cases, surveillance of susceptible persons, and selective vaccination, for the first time in history, progress was made in beginning to defeat this devastating infection. In 1972, as a result of progress in disease eradication, the U.S. ended routine smallpox vaccinations. The last naturally occurring case of smallpox was reported in Somalia in 1977. The WHO announcement in 1980 that smallpox was at last eradicated was one of the greatest public health victories in human history. As a result of the 1972 Biological and Toxic Weapons Convention, supplies of any existing smallpox virus were to be stored in one of two places - the Centers for Disease Control and Prevention in Atlanta, GA., and the State Research Center of Virology and Biotechnology in the Soviet Union. The Convention prohibited any further development of the virus as an offensive weapon. However, the former deputy director of the Soviet Unions bioweapons program, after defecting to the U.S., reported that starting in 1980, the Soviet government developed a successful program to produce the smallpox virus in large quantities and to adapt it for use in bombs and intercontinental ballistic missiles. He further reported that the Soviet Union continued to do research aimed at producing more virulent and contagious smallpox strains. Due to the breakup of the Soviet Union, many scientists with expertise in this area are unemployed and displaced. Today, there is a great deal of concern that both the existing and unaccounted for stockpiles of smallpox, along with the expertise to know how to develop and disseminate it, could fall into the hands of rogue countries, groups, or individuals who intend to use smallpox as a bioweapon against the U.S. or other countries. A weaponized form of smallpox could be devastating, due to the airborne transmissibility of the virus, the relative ease of large-scale weapons productions, and the vast number of people without immunity to smallpox. The transmission of smallpox is of great concern because most of the human population is susceptible to infection. It is expected that the rate of smallpox transmission would be higher today than in any previous outbreaks because of the worldwide lack of immunity. Due to the fact that most of the world’s population is not immune to smallpox, the rate of smallpox transmission could be higher than during any previous epidemics. 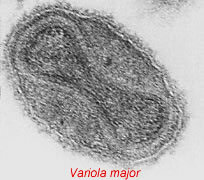 The virus that causes smallpox occurs in two predominant strains  variola major(right), which has a 30% or greater mortality rate, and variola minor, with a 1% mortality rate. Hemorrhagic smallpox and malignant smallpox are two rare but deadly strains of the disease. Before the introduction of smallpox vaccination, almost everyone eventually developed smallpox, and either died of it or developed lifelong immunity. Smallpox is highly contagious. The virus spreads from person to person primarily by droplet nuclei or aerosols expelled from the throat of infected persons and by direct contact. Contaminated clothing or bed linens can also spread the virus. Historically, the seasonal occurrence of smallpox is similar to that of chickenpox and measles  with incidence higher in winter and spring. The infectious dose is unknown, but is believed to be only a few virons. In the 1960s and 1970s in Europe, during a very limited smallpox outbreak, individuals with the infection transmitted smallpox to as many as 10 to 20 other people. Before the introduction of smallpox vaccination, nearly everyone developed smallpox and died from it or developed lifelong immunity. The incubation period of smallpox ranges from 7 to 17 days, with an average length of time between exposure and symptom development of 12 to 14 days. The patient then typically develops a high fever, malaise, and prostration, with headache and backache. Severe abdominal pain and delirium are sometimes present. A maculopapular rash then appears on the mucosa of the mouth and throat, and the face and forearms, and spreads to the trunk and legs. A person with smallpox is sometimes contagious with onset of fever (prodrome phase), but the person becomes most contagious with the onset of rash. The lesions that first appear in the mouth and throat release large amounts of virus into the saliva. Smallpox pustules are characteristically round, hard, and deeply embedded in the dermis. Crusts begin to form on about the eighth or ninth day of the rash. As the patient recovers, the scabs separate and pitted scars develop, primarily on the face. Patients with smallpox can transmit the disease before the rash appears. The majority of smallpox cases present with a characteristic rash that is most dense on the face and extremities. The lesions appear over a 1 to 2 day period and evolve at the same rate. On any given part of the body, they are generally in the same stage of development. In varicella (chickenpox) the disease most frequently confused with smallpox, new lesions appear in crops every few days and lesions at very different stages of maturation are found next to each other. Varicella lesions are much more superficial and are almost never found on the palms or soles. Chickenpox also has a much greater concentration of lesions on the trunk than on the face and extremities. Unfortunately, there are no drugs currently available to treat smallpox. At this time, treatment consists of supportive therapy plus antibiotics as needed for treatment of secondary bacterial infections. Although some antiviral agents are being studied for their effect on the smallpox virus, no antiviral substances have yet proved effective for the treatment of smallpox. Except for the lesions in the skin and mucous membranes, other organs are seldom involved. Patients who die of smallpox usually do so during the second week of illness. In past epidemics, death from smallpox usually resulted from secondary infection and inadequate nutrition and hydration. Therefore, maintaining adequate hydration and nutrition is imperative, although eating and drinking are difficult due to the painful pustules that sometimes form in the mouth and oropharynx. Intravenous fluids may be needed to prevent dehydration and antipyretic medications can be used to control fever. External lesions should be kept clean and dry. A smallpox outbreak poses difficult public health problems because of the ability of the virus to continue to spread throughout the population unless checked by vaccination and/or isolation of patients and their close contacts. Early detection, isolation of infected individuals, surveillance of contacts, and a focused selective vaccination program are the essential elements of a smallpox control program. As soon as the diagnosis of smallpox is made, all persons who are suspected of being infected with smallpox should be immediately isolated and all contacts should be vaccinated and placed under surveillance. It is recommended that contacts be defined as persons who have been in the same household as the infected individual or who have been in face to face contact with the patient after the onset of fever. Because the widespread dissemination of smallpox virus by aerosol poses a serious threat in hospitals, patients should be isolated at home or in other non-hospital facilities whenever possible. During the worldwide eradication campaign, investigations showed that smallpox was spread throughout hospitals via ventilation systems. Hospital acquired infections may be acquired as a result of droplets spread from patients to staff and visitors in reasonably close contact or by a fine particle aerosol. In one situation in Germany, a smallpox patient with a cough, who was isolated in a single room, infected persons on 3 separate floors of the hospital. A number of outbreaks have also occurred in laundry workers who handled linens and blankets used by patients. It is recommended in an outbreak setting that all hospital employees as well as patients in the hospital be vaccinated. For persons who are immunocompromised or for whom vaccine is otherwise contraindicated, vaccine immune globulin (VIG) can be given as an alternative. Due to the ease of transmission of smallpox in hospitals, most patients with smallpox should be cared for at home if possible. If a large outbreak occurs, patients who have active smallpox infections may be quarantined. Although cooperation by most patients and contacts in observing isolation could be ensured through counseling and persuasion, there may be some for whom forcible quarantine will be required. Some states and cities in the U.S., but not all, confer broad discretionary powers on health authorities to ensure the safety of the publics health and at one time this included powers to quarantine. Under epidemic circumstances, this could be an important power to have. In larger outbreaks, home isolations and care should be the objective for most patients. In caring for a patient with smallpox in the home, caregivers must practice strict infection control measures. All contaminated instruments, surfaces, excretions, fluids, and other materials should be incinerated or decontaminated chemically. Clothing and bedding should be incinerated, autoclaved, or washed in hot water and hypochlorite bleach. Before 1972, smallpox vaccination was recommended for all U.S. children at age 1 year. Most states required that each child be vaccinated before school entry. Routine vaccination in the U.S. stopped in 1972 and since then, few persons younger than 27 have been vaccinated. According the U.S. Census Bureau, in 1998, 42% of the U.S. population was age 29 years or younger. The immune status of those who were vaccinated before smallpox vaccination ceased is not clear, as the length of immunity has never been satisfactorily measured. Neutralizing antibodies have been shown to decline substantially during a 5 to 10-year period. Thus, even those who received the recommended single dose vaccination as children do not have lifelong immunity. Because comparatively few persons today have been successfully vaccinated on more than 1 occasion, it must be assumed that the population at large is highly susceptible to infection. A single smallpox vaccination produces lifelong immunity to the disease. During the smallpox epidemics in the 1960s and 1970s in Europe, there was considerable public alarm whenever outbreaks occurred and often a demand for mass vaccination, even when the vaccination coverage of the population was high. In the U.S., where few people have protective levels of immunity, such levels of concern must be anticipated. However, the present U.S. vaccine supply is limited and vaccine would have to be carefully conserved and used in conjunction with measures to implement rapid isolation of smallpox patients. The U.S. government is currently taking measures to rapidly increase the supply of smallpox vaccine. In addition, there are some risks associated with smallpox vaccination. 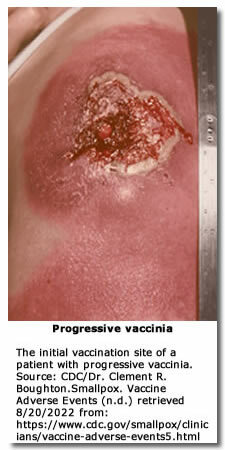 Complications of smallpox vaccination include postvaccinal encephalitis, progressive vaccinia  a condition in which the vaccination lesion fails to heal and involves other body tissues, and accidental inoculation of other parts of the body such as the eyes or mouth, usually by scratching the smallpox vaccination site. Vaccinia immune globulin (VIG) may be given as an alternative to patients in high-risk groups. VIG may also be given to treat patients with progressive vaccinia. Because the availability of VIG is limited, its use should be reserved for the most serious cases. The U.S. government is working with manufacturers to produce additional doses of smallpox vaccine. To control a smallpox epidemic, it is likely that selective focused vaccination would be used rather than a mass vaccination program. It is important for health care professionals to explain to the lay public why selective vaccination rather than widespread vaccination may be used to control a smallpox epidemic. Selective vaccination, rather than mass vaccination, would be the strategy most likely used to control a smallpox epidemic. Vaccination given within the first few days after exposure to a person with smallpox may prevent or lessen smallpox symptoms. Should a smallpox outbreak occur, an emergency vaccination program would be implemented that would include all health care workers at clinics or hospitals that might receive patients, all other essential disaster response personnel, such as police, firefighters, public health and emergency personnel and mortuary staff who might have to handle bodies. Both airborne and contact precautions should also be used in postmortem care. Whenever possible, patients who die of smallpox should be cremated. Smallpox vaccination has no effect once a person has been exposed to someone with smallpox.